Tent Pole Section 11mm in diameter and 452cm long. Ideal for use with ring and pin tents and can easily be cut to length using a hacksaw. 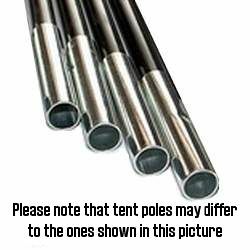 If you should break a tent pole then you will need one of our replacement pole sections. Poles come in a variety of diameters and lengths, so check to see if you are buying the right one before you place an order. We stock most diameters and lengths on our website so you should be able to find the right one.